Kartik is Executive Director of Asha Impact – an impact investment and policy advocacy platform set up by Indian business leaders including Vikram Gandhi, Pramod Bhasin, Ashish Dhawan and Amit Chandra. He leads the investment activities of Asha in its focus areas including affordable housing, waste management, financial inclusion, energy access, education and technology for development. Kartik also manages the policy advocacy and ecosystem building activities of the Asha Impact Trust – sharing the lessons from inclusive business models with the government and building the market for social impact bonds. After returing to India from the US in 2005, Kartik worked an investment banker with Merrill Lynch to execute several large capital market, M&A and PE transactions before joining the impact investment industry in 2008. Prior to setting up Asha Impact in 2014, he worked as Senior Investment Manager with Aavishkaar’s Frontier Fund, leading the expansion into new South Asian markets; and previously as VP-Investments at Lok Capital managing a portfolio of microfinance investments and entry into new sectors. In addition to serving on the boards of several social businesses, Kartik is a member of the Executive Committee of the Impact Investors’ Council. Over the last 15 years he has led several pioneering initiatives like the Rockefeller Foundation’s India venture philanthropy project in 2000 and the India-Pakistan Expatriate Peace Delegation in 2005. He has worked with the UNDP to improve its operations in West Africa and been a judge on “The Real Deal”, the world’s first reality television show on impact investing. Kartik is also the Founder of What’s up Bharat – a social enterprise that ran a coworking and cultural center in Delhi from 2011 to 2013 with a daily program of talks and workshops and runs the ‘QNA’ data analytics app for comparing attitudes on social and political issues. 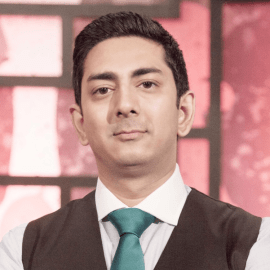 Kartik has a Bachelors in Finance from the Wharton School, University of Pennsylvania, and a Masters in International Affairs from SIPA, Columbia University.